Not a particularly up-to-the-minute review (this was out in March and it’s been a good few months since I read it myself), but hey, there’s a paperback due out in April 2011 (at the time of writing and according to Amazon), so it’ll seem fresh then. This is actually the first novel by Alastair Reynolds that I’ve read – probably pretty remiss of me as a genre fan given that he is well-regarded. Furthermore, from what I know of his writing, this isn’t really all that representative of his novels; he’s famed for his space operas (many of which are, at the least, loosely connected). Of course, short of ringing up everybody that’s read this book, I have no way of knowing what everybody thinks of it. That said, I have noticed in that bastion of critical integrity, Amazon customer reviews, that there are a number of people who are disappointed in this novel. And, yes, I realise that they are a self-selecting bunch etc., etc., but I’d be surprised if they were the only people who felt this way. Interestingly, one of the main gripes about this novel seems to derive from Terminal World not being his usual hard SF/space opera fare. In some ways it was this that attracted me to it – having not read any of his other full-length fiction, I wanted to read something stand-alone; on the off-chance that I didn’t enjoy it. Happily, I did. It’s up to the author what the hell they write. If you don’t like it, fine, don’t read it, but it’s the authors choice to make. There is an issue around this becoming restrictive. At a basic level, the protagonist will start to (hopefully) develop well-defined character traits. By writing a series of novels featuring this one person, they won’t be able to deviate too far from this template without ruining their character. There are other issues that I can think of, and, naturally, developing characters and worlds over a series of novels can be rewarding if the writer is able to craft a rich novel populated by well-rounded characters. That notwithstanding I’m inclined to think that the decision to write more novels in a series (or not) should be that of the author. To be clear, I’m not criticising multi-volume series; I have read plenty of excellent series of novels. Anyway – back to the novel in hand! I’ve seen Terminal World described as being a steampunk novel (in fairness, possibly by Reynolds, though I think he said steampunk-influenced). It’s not. It does have one sort of steampunky element to it, but I don’t think that’s a particularly good sub-genre to pigeon-hole the novel in. 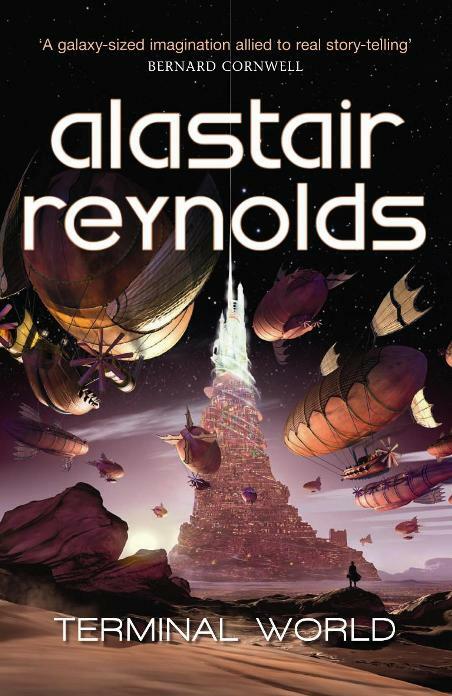 Reynolds creates a more interesting far-future world than descriptions of steampunk might evoke. The novel is set in a far-future, decaying world. At the start of the novel, all we are aware of when it comes to civilisation, is a huge city, situated in a vast spire, named Spearpoint. At the heart of Spearpoint (and indeed, it transpires, the rest of the world) is a nice conceit around the idea of “zones.” Each zone is able to support a certain level of technology, so the higher zone, The Celestial Level, is inhabited by the “angels” who are post-humans who rely upon nanotechnology in their bodies to survive. Below this is polities based upon cybernetics, Circuit City, Neon Heights, which is, technologically, on a par with 20th Century technology. Moving down, we find ourselves in Steamville (this is partly, I suspect, where the idea of steampunk comes from) which is, naturally, powered by steam and finally Horsetown. Outside of Spearpoint, these zones are replicated, and go one further by including “The Blight” where not even biological life is able to survive. Outside Spearpoint, the idea of zones continues, though they appear to be less rigidly defined than is the case in Spearpoint. Moving between zones is made difficult by the fact that each only supports a certain level of technology – so for example, a computer wouldn’t work in Steamville and steam trains would be similarly useless in Horsetown. This extends to people as well. It’s possible to survive in zones that you weren’t born in, through the use of “anti-zonal” drugs, for the most part, however, people are pretty much restricted to where they were born. Though this doesn’t extend to the angels, whose reliance on nano-technology in their bodies forces them to be aloof from the rest of humanity. The story itself actually concerns an angel who had been reverse engineered to pass for base-human and survive in the lower levels (this involves removing his nano-technology and, continuously, altering the more obviously different post-human aspects of his physiology). For reasons which are explained as the novel progresses, other angels are out to kill this altered angel, one Quillon. His attempts to evade them take him outside the comfort of Spearpoint to the unknown of the Outzone. This leads to him being forced to evade Skullboys (reminiscent, I’m sure, of any number of post-apocalyptic biker gangs), insane, brain-eating cyborgs before being rescued by Ricasso and the Swarm. The Swarm being a huge fleet of airships who maintain a sort of civilisation in the wilds of the outzone. There’s a lot to admire in Terminal World . The story is an exciting one, it’s paced well and the world-building is excellent. Also, though there is necessarily expository dialogue, this novel really doesn’t suffer from excessive info-dumping. Part of this is, I think for an extremely good reason. Terminal World is set far into the future, yes, but it’s also set in a time of ignorance. This means that it would be obviously the authors voice that was explaining the world, and not the characters. For the most part, people don’t really understand the technology that they may have access to, or the world around them. This extends to the angels, who, though they may be obvious products of high-technology themselves, merely use it. Thy don’t really have any true insight – you may say that all of the people are book-smart at a societal level. The only character who really makes an effort to try and understand the world around him is the leader of The Swarm, Ricasso, and it’s worth noting that many around him are suspicious of his attempts to revive the scientific method. There are also some nice touches in the novel, references to the past which I thought gave it a little grounding for the reader, but – seen through the eyes of the protagonist – would be meaningless. Overall an excellent introduction to Reynolds long-form fiction for me. The zone conceit and the state of the world are well-handled. Mostly he pitches his characters well, and a believable picture of the world is revealed through their eyes. Also, the idea of the zones does actually have some narrative use beyond every so often throwing up obstacles for our heroes to negotiate. Further, his prose is serves to evoke the idea of a hostile world, in which human life isn’t quite welcome. Worth your time. This entry was posted in Review and tagged alastair reynolds, novel, sf, wales. Bookmark the permalink. Hmm, good review but I’m stuck in the middle of this book at the moment and need to grit my teeth and get back to it. I’m a core Reynolds fan – I’d buy a t-shirt if he sold them – but while this is interesting, it’s not Reynolds absorbing or Reynolds clever. I’m not blown away by it or made to think he’s amazing, but then that’s massively hard to pull off time after time. I like Quillon, but I’m not that bothered by his fate. Spearpoint was far more interesting than the Blight. Interesting that: Adam Roberts wrote a review on his blog (Punkadiddle) and, though he was mostly positive, he did suggest that there was a little narrative sag. I noticed that less, but my motivation for reading was different. Maybe. I’ll be reading more, though! I thought that Reynolds calls the zone where life can’t exist “The Bane”, not “The Blight”? I’ve read most of Reynolds’s other novels and I quite enjoyed this one. While the “Revelation Space” universe is undoubtedly rich and well thought out, its nice to see him moving on to pastures new as it were. The different setting means you can discover a whole new universe, like when you first read “Revelation Space” or “Chasm City”. The only thing that disappointed me was finding out that this is a stand alone novel. Lots of threads were left open, and while I understand the author wanting to keep some mystery, its irritating to have parts of the book remain unexplained without hope of them being revisited in the future. My favourite parts of this book are the little references that hint at differences between this “Earth” and ours, such as different common measurements for distance, longer years etc.